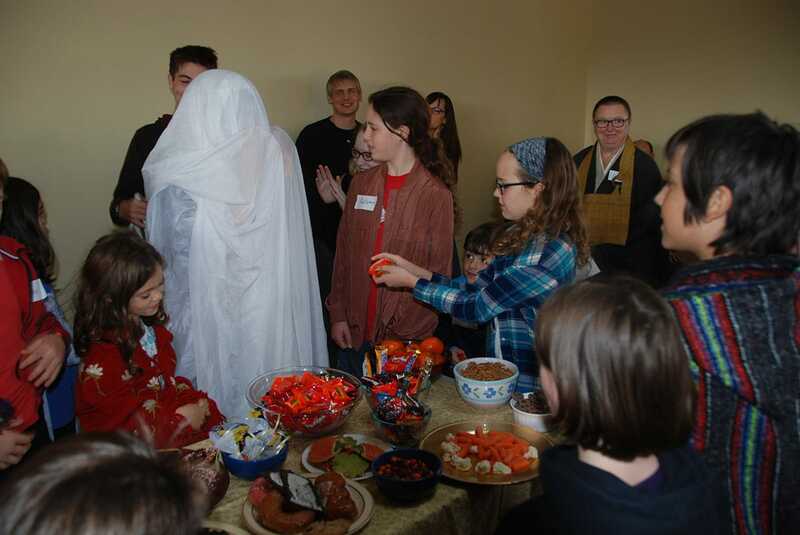 At Dharma Rain Zen Center’s Segaki ceremony, celebrated each year around Halloween, “hungry ghosts” enter the zendo to feast on sweet treats and learn to behave in a Buddhist temple. Photo courtesy Dharma Rain Zen Center. 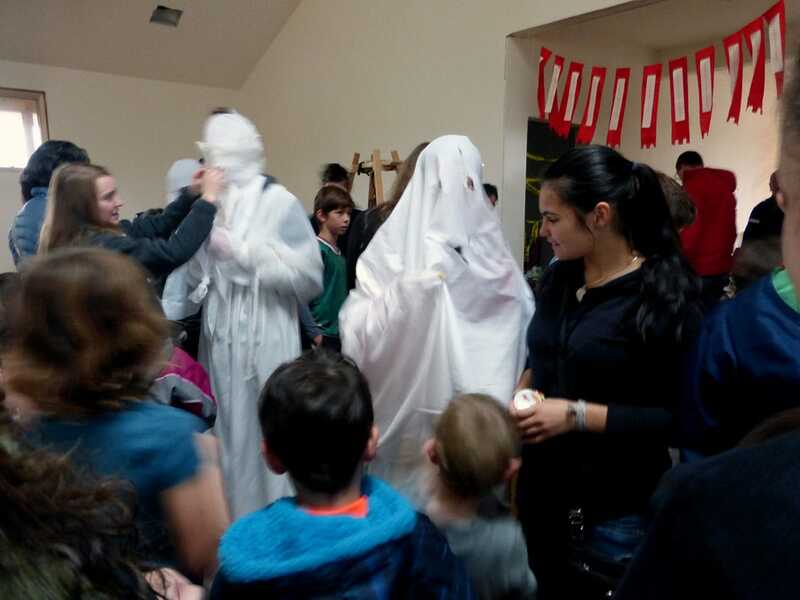 Hungry ghosts try to enjoy a treat at Dharma Rain Zen Center’s Segaki ceremony. 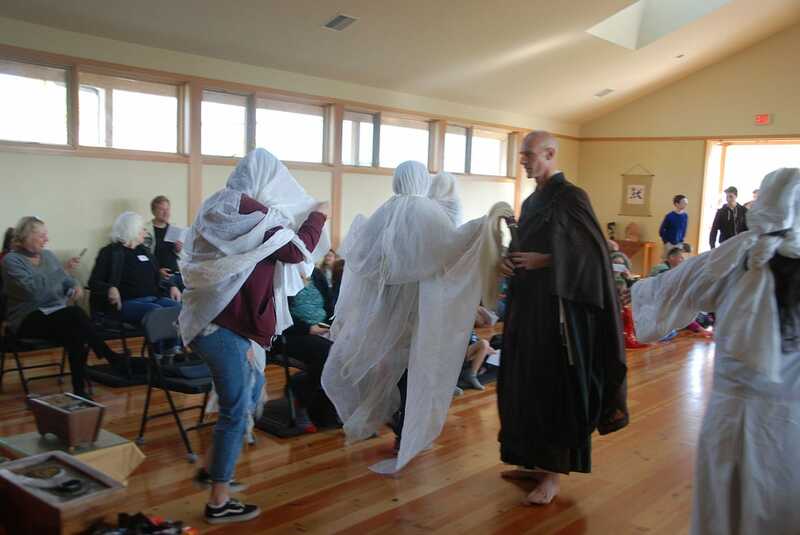 At Dharma Rain Zen Center in Portland, Oregon, Halloween and traditional Buddhist practice come together in the annual Segaki festival, celebrated every year in late October. 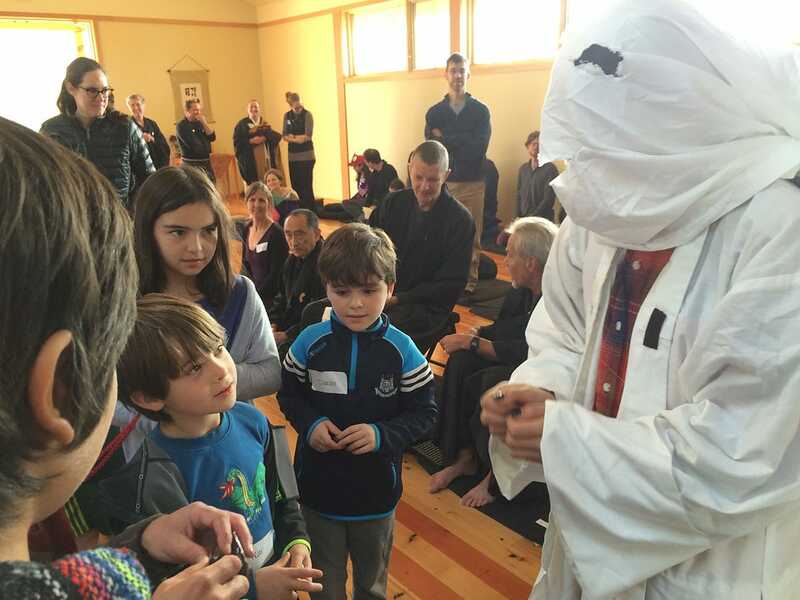 For one weekend, ghosts, costumes, and treats enter the zendo for a meaningful and joyous ceremony enjoyed by both children and adults. “Segaki,” which means “feeding the hungry ghosts,” is one of the most important festivals on Dharma Rain’s calendar. The celebration is used as a time to honor deceased friends and family and to turn inward and let go of the “hungry ghosts” — also referred to as gakis — within ourselves. 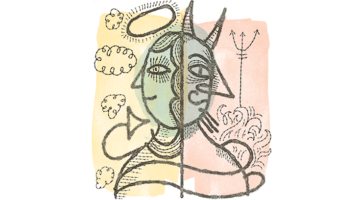 “The coming of autumn seems to encourage turning inward and confronting our own hungry ghosts, and this kind of introspection is part of our practice during Segaki retreat,” says Shin’yu Vitells, a monk at Dharma Rain. As the late Kyogen Carlson, the former Abbot of Dharma Rain, wrote in “On Segaki”, the festival is said to have begun when a disciple of the Buddha, Moggallana, deeply connected to his deceased mother, had dreams of her suffering in a world where she couldn’t eat or drink, a world known in the Buddhist wheel of life as the realm of the hungry ghosts. 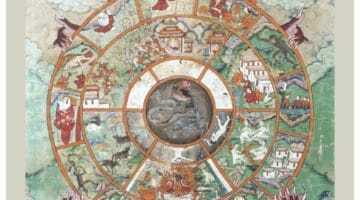 The Buddha instructed Moggallana to make an offering of food that his mother could easily accept and digest in a ceremony dedicated in her name, as a way to cleanse their connected karma. 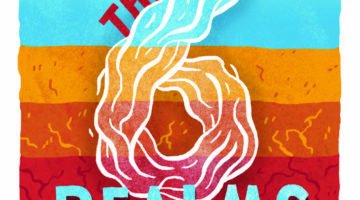 In Chinese legend, Moggallana traveled to the hell realms to personally rescue his mother, and when he broke the lock on the gate to hell, all the hungry ghosts escaped into the human realm. During the seventh lunar month, the month of the dead in China, the hungry ghosts are said to be released from hell, and a joyous celebration is held to pay respect to all deceased beings through offerings of food and entertainment. Through the offerings, the hungry ghosts are said to be released from suffering, and those who still have learning to do are convinced to return where they belong. Years ago, a visitor at Dharma Rain told of China’s Segaki practices, and Dharma Rain adopted the practice to complement American Halloween festivities. This year at Dharma Rain, the Segaki retreat will be held from October 27 to 29. While the retreat allows an opportunity for spiritual renewal and karmic cleansing, it culminates in a particularly joyful ceremony on the final day. The inclusion of the 67 children enrolled in Dharma Rain’s Dharma School, make the Segaki ceremony extra special. The Segaki altar is prepared with offerings of food. Hungry ghosts are invited to join the final celebration, which in turn invites “all the unhappy, unresolved karma in the universe to come to the altar to receive the Dharma in the form of food.” There is also incense offered, and the names of those who have died in the past year are read. 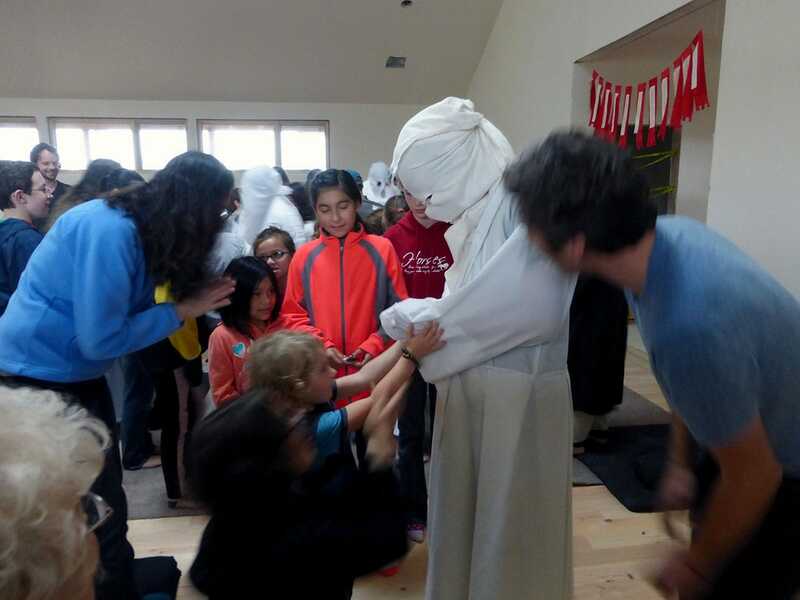 Next comes the real fun — live gakis, or hungry ghosts, arrive to visit the Dharma School children. 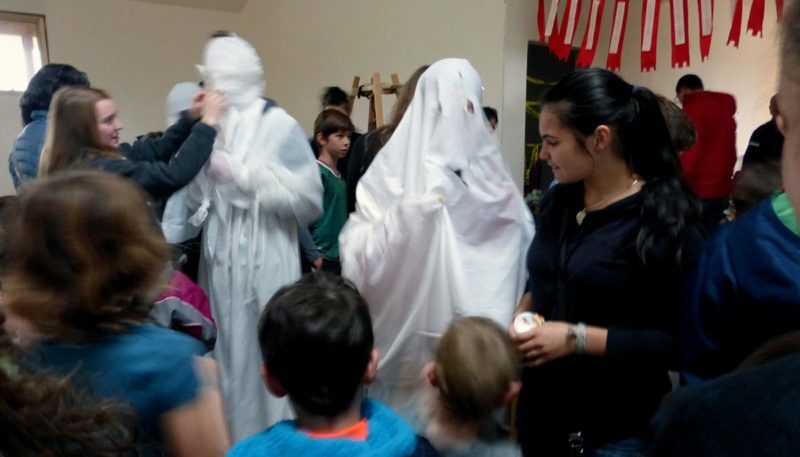 The gakis are played by several of Dharma Rain’s high school students dressed up with white sheets covering their heads and wearing shoes — something quite shocking for the children to see in a Buddhist temple. As the gakis misbehave in the zendo, it’s up to the Dharma School children to show them the rules. 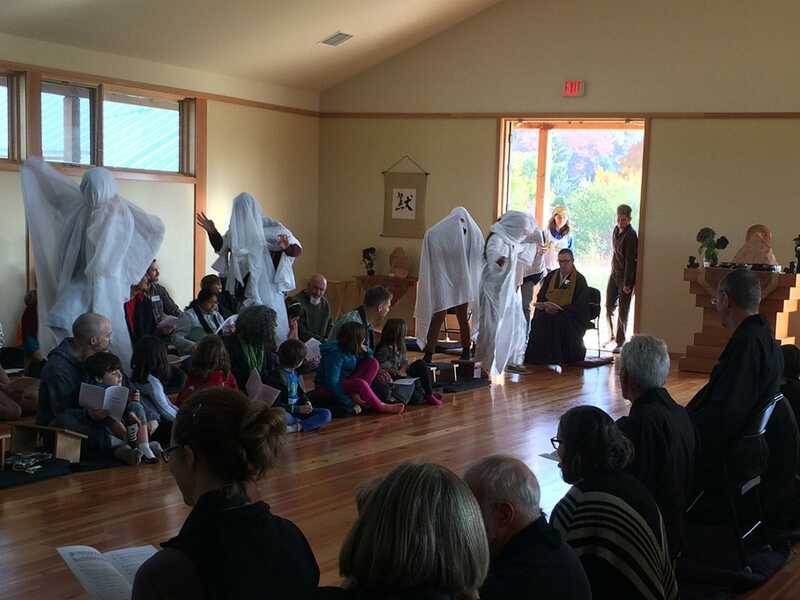 “The gakis come into the zendo with their shoes on, make a lot of noise, grab sweets off the altar, refuse to bow and so on,” says Shin’yu Vitells. A gaki is taught how to bow in the zendo. Photo courtesy Dharma Rain Zen Center. 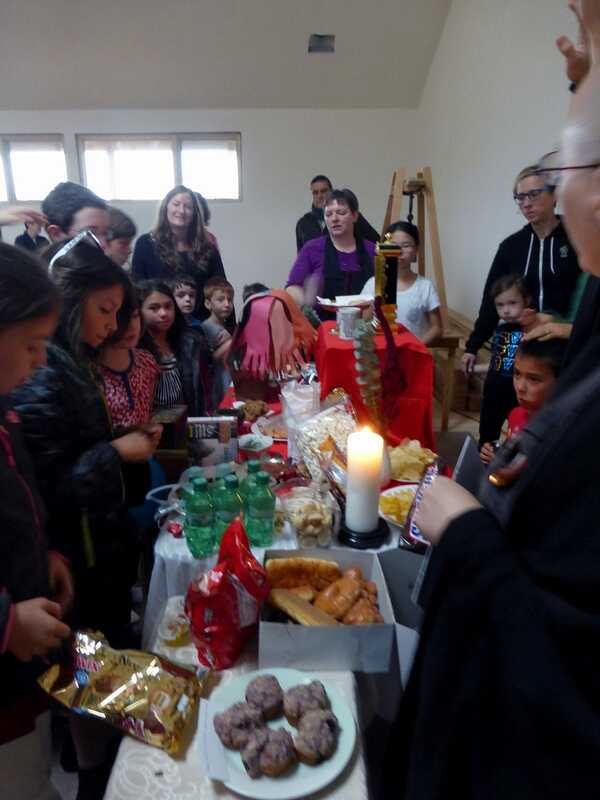 Together, the children and the gakis eat the treats on the altar, and retreat participants join in the feast. A gaki visits the Segaki altar. After the hungry ghosts have learned their lessons, Segaki at Dharma Rain culminates in the evening with Segaki Toro, a closing ceremony in which a fire is lit. On slips of paper, participants write the names of the deceased, and any personal problems they’re looking to let go of, and release them into the fire.